Battle Of Shunyi: Police Arrest Two Poachers! After an evening of drama, tonight the Beijing police arrested two poachers on my local patch. Returning home at about 5pm I decided to go to the roof of my apartment block to scan for illegal mist nets. To my surprise there were two guys putting up nets in the same area as on Friday! It was just a few days after I discovered, and took down, some illegal mist nets and told the poacher that if I saw him again I would send his photo to the police. And yet here he was again, with a friend, in exactly the same spot. He can’t say he wasn’t warned! After a quick phonecall the police were on their way and, this time, they would catch the poachers red-handed. One had a Japanese Sparrowhawk and, as I led the police to the spot, the poacher inadvertently walked straight towards us with his illegally caught bird of prey on his wrist. He was so shocked to see us that he froze, allowing one of the officers to grab him by the scruff of the neck. After a few choice words the poacher led the police to the mist nets and it was here that they apprehended, after a brief attempt to flea, the second poacher. After taking photos for evidence and then taking down the nets, the police escorted the poachers to the local police station for questioning. I don’t know what the outcome will be but being in possession of a bird of prey, a state protected species, is a serious offence. And so, after several days of battling these poachers, it was gratifying to finally catch them. I cannot praise the Shunyi State Forestry Police high enough. They responded quickly, with enthusiasm, and effectively apprehended the poachers. I am sure these guys will refrain from trapping wild birds for the foreseeable future.. and I hope their arrest will act as a deterrent for others, too. The Beijing State Forestry Police apprehending one of the poachers. Beijing police taking down the illegal mist nets. Posted on September 15, 2015 September 15, 2015 Categories UncategorizedTags Illegal Mist Nets, Poachers, Shunyi13 Comments on Battle Of Shunyi: Police Arrest Two Poachers! 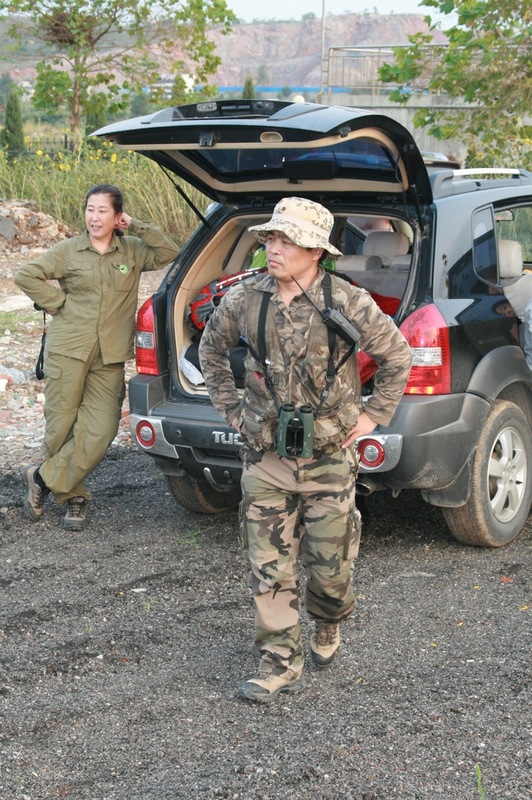 The Battle of Shunyi: Local Police Act Fast To Tackle Wildlife Crime! 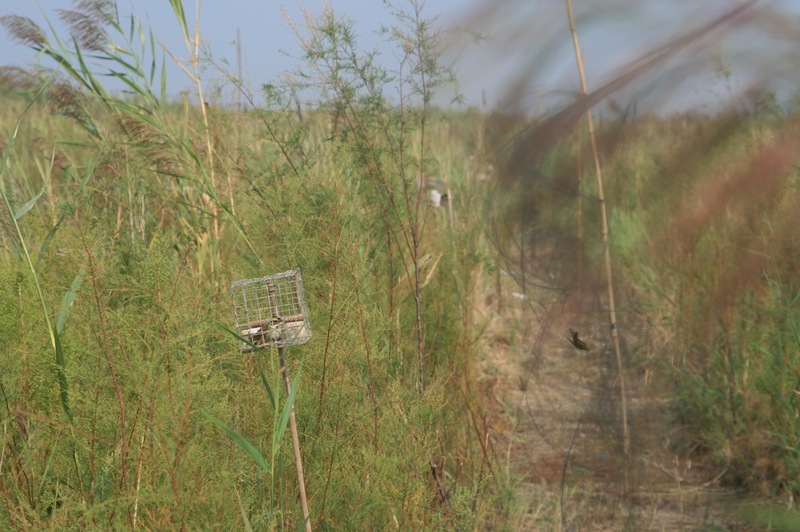 With autumn migration in full swing, poachers are out in force trying to trap species such as the Siberian Rubythroat or Bluethroat for the cage bird trade. Encouragingly, the local police are acting fast and doing what they can to stop them! When I moved to the Shunyi District of Beijing this Spring, I was lucky enough to find, very close to my apartment block, an area of scrub. Scrub, as any birder will tell you, attracts birds and, during spring and autumn migration in Beijing, a LOT of birds. Since early May I have recorded exactly 70 species in this little wild patch on the outskirts of one of the most populous capital cities in the world. Right now it hosts Siberian Rubythroats, Thick-billed, Lanceolated, Pallas’s Grasshopper, Dusky and Yellow-browed Warblers, Stonechats and Brown Shrikes. It is perhaps not a surprise that the area has also attracted the attention of poachers who illegally trap birds for the cage bird trade. 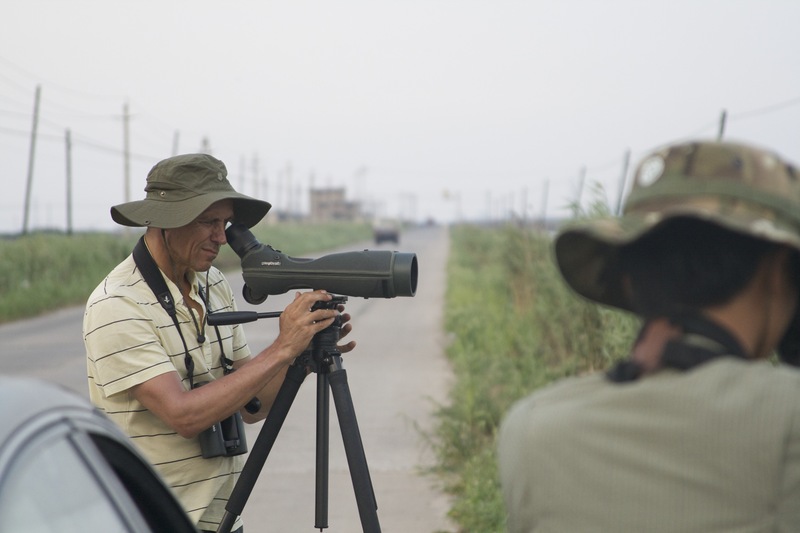 The last few days – peak migration season for some of the most sought-after species, such as Siberian Rubythroat and Bluethroat – has seen the beginning of a battle… between me, the birder (and good guy, obviously), and the poachers (the bad guys). First, three days ago, I discovered about 150m of mist nets with a MP3 player blaring out the song of Siberian Rubythroat. In fact it was the song – which I assumed was coming from a wild bird, unusually singing in autumn – that first drew me to the precise spot. As I climbed over a heavily weeded mound, there they were – mist nets, very carefully and professionally set up. The poachers place their illegal mist nets along lines of cleared scrub, catching birds as they fly from one side of the clearing to the other. At this point I couldn’t see anyone, although I suspected the poacher was nearby. Without thinking, I immediately started to dismantle the nets, ripping them so they would be rendered useless and snapping the bamboo poles and chords.. After a few minutes the poacher appeared and shouted at me to leave the nets and to go. I think he knew by the look in my eye and the expression on my face, that wasn’t going to happen. I grabbed my camera and, despite him becoming incredibly camera-shy, I took a photo of him before continuing to dismantle the nets. I told him that he was breaking the law and that I would call the police. He suddenly became very cooperative, offered me a cigarette (refused) and even started to help me take down the nets. After about 10-15 minutes I had destroyed all of the nets and poles. I made it clear that if I saw him again, I would send his photo to the police. Dismantled mist nets. These will never be used again to catch wild birds. 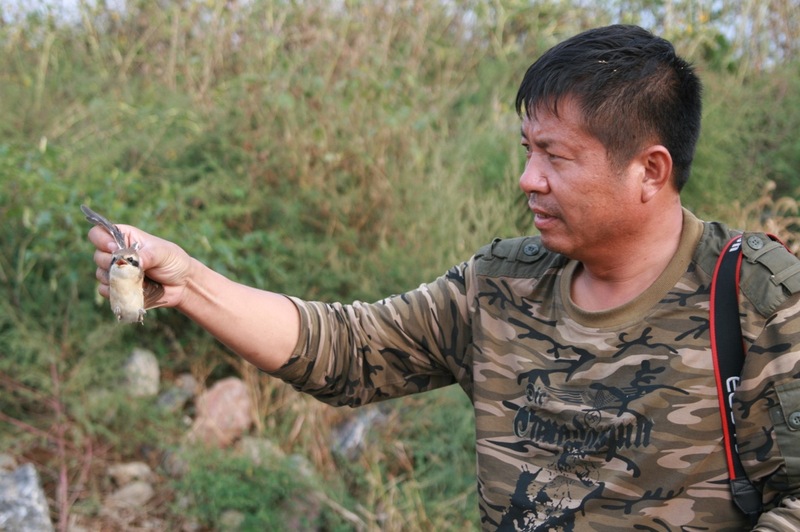 The camera-shy poacher in Shunyi. 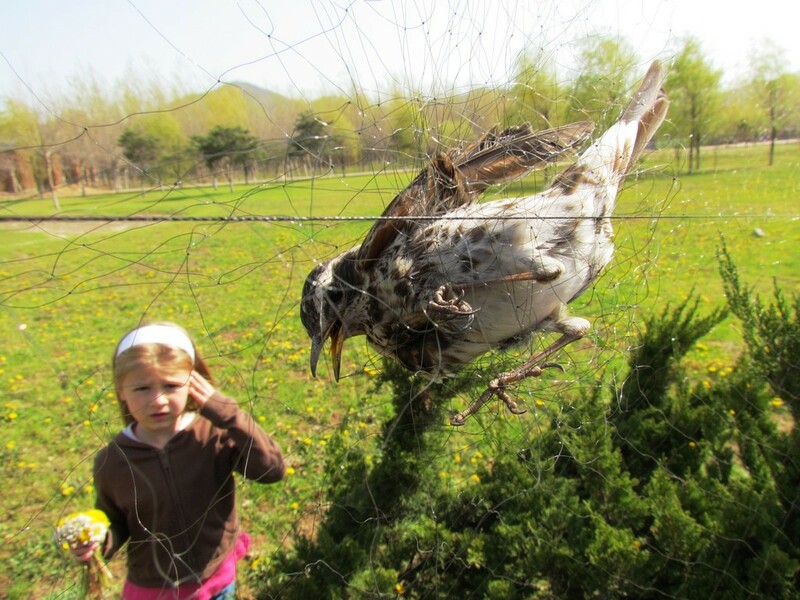 A SIBERIAN RUBYTHROAT trapped in an illegal net. 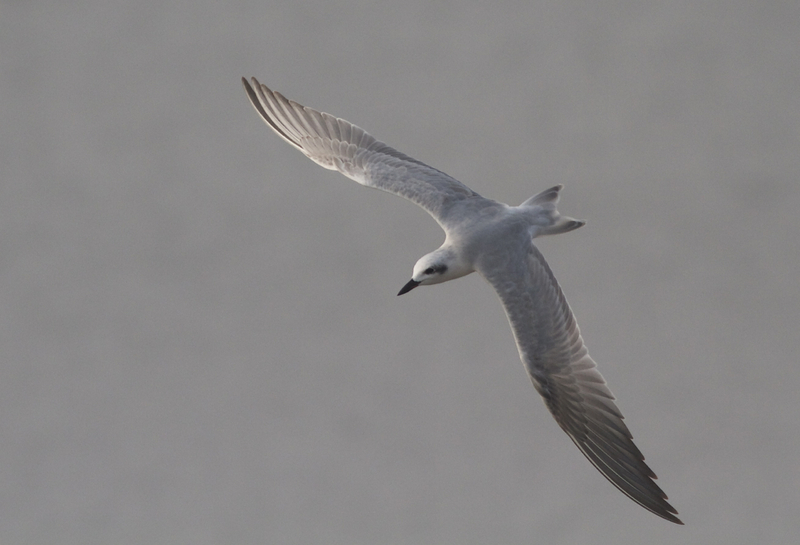 This one was lucky – after release, it flew off strongly. The next morning, I was on site at first light to check the area. There were no nets and no poacher. I began to check the vicinity and immediately found a mist net, not far from the scene of the encounter the day before and, I suspect, abandoned by the same poacher. There were 6 birds caught up, their struggles to free themselves only causing them to become more entangled. There were 2 Siberian Rubythroats, a Pallas’s Grasshopper Warbler, 2 Stonechats and a Richard’s Pipit. My first priority was to release the birds and it took me 30 minutes of careful and concentrated effort to free them all. One of the Rubythroats was particularly weak but, after resting on the ground for a few minutes, managed to fly into the scrub. One of the Stonechats had a wounded leg but nevertheless was able to fly strongly. The Richard’s Pipit flew up high, uttering it’s familiar “shreep” call before heading strongly southeast – a wonderful sight to see. The Pallas’s Grasshopper Warbler, as anyone who has seen one will be familiar with, darted into deep cover never to be seen again. After dismantling the net and breaking the poles and chords, I searched the rest of the area before heading home for breakfast. Fast forward to this morning. I was due to have a Chinese lesson at 0900, which would mean leaving my apartment at around 0800. Before heading out, I decided to spend an hour or so on the roof of my apartment block to see whether there was any visible migration after the overnight rain. With a few Richard’s Pipits and Yellow Wagtails moving, there were enough birds to hold my interest but nothing spectacular. After about half an hour I realised that the height of the roof provided a great vantage point from which to scan the whole area for mist nets. It wasn’t long before I could see about 300m of mist nets with four guys standing around and occasionally retrieving unfortunate birds as they flew into the invisible traps. My heart sank. A friend had provided me with the number of the local police and, after calling them, I was surprised and delighted with their response – they would come immediately! My directions were not perfect (my Chinese is still not of a sufficient standard) so they asked me to meet them there to show them the spot. I cycled and waited by the roadside, the poachers and nets out of sight the other side of a wall adjacent to the road. It wasn’t long before one of the poachers appeared from behind the wall to fetch some water from his car.. As he walked past me, he looked at me suspiciously as I desperately tried to pretend (unsuccessfully, I think!) that the reason for me being there was that I had a problem with my bike..! A few minutes later, two of the poachers emerged and drove away… I suspected that they realised something was afoot. Just a few seconds later the police arrived… but on climbing through the hole in the wall, the poachers were now nowhere to be seen – they had almost certainly been spooked and, as two of the poachers drove their cars to the other side of the scrubby area, another had taken out all of the birds and the poachers’ belongings via another entrance (the movement of cars seemed to suggest this). Nevertheless, the police and I took down and destroyed all of the nets and the police took copies of the photos of the poachers’ vehicles I had taken with my iPhone. Although the police must catch the poachers red-handed if they are to secure a prosecution, the evidence helps to build up a supporting case. Shunyi Police were quickly on the scene and destroyed the nets. So, although the poachers got away this morning, I feel hugely encouraged. The Shunyi police were superb. They responded quickly (on site within half an hour), they were supportive and the chief officer even gave me his personal mobile phone number and said to call him straight away if I find more nets or poachers. I suspect the poachers were given a good scare, too, and I would be surprised if they returned to this area. This was a model response by the police and they should be congratulated for taking wildlife crime seriously. I will certainly be saying lots of good things about them on Chinese social media. If further motivation was needed to stamp out this cruel practice, I was shocked to find the head of a Dusky Warbler underneath one of the nets. The Dusky Warbler is insectivorous and is not a beautiful singer. 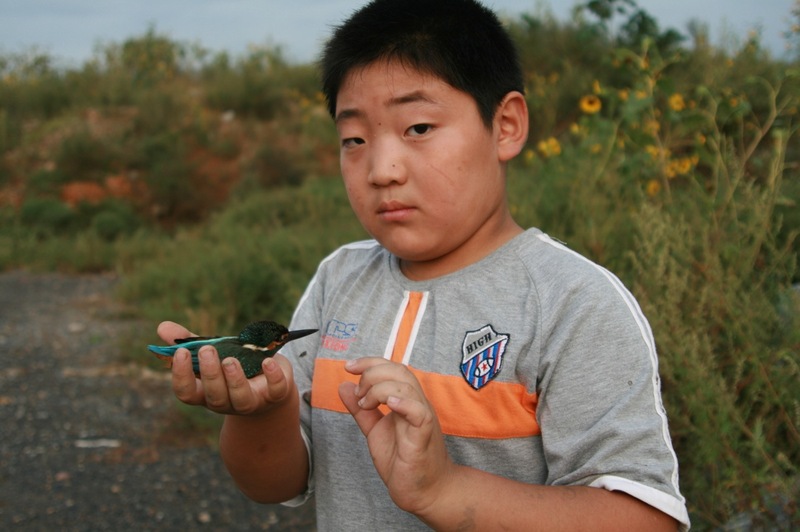 It is “by-catch” for the poachers who are targeting Siberian Rubythroats and Bluethroats. 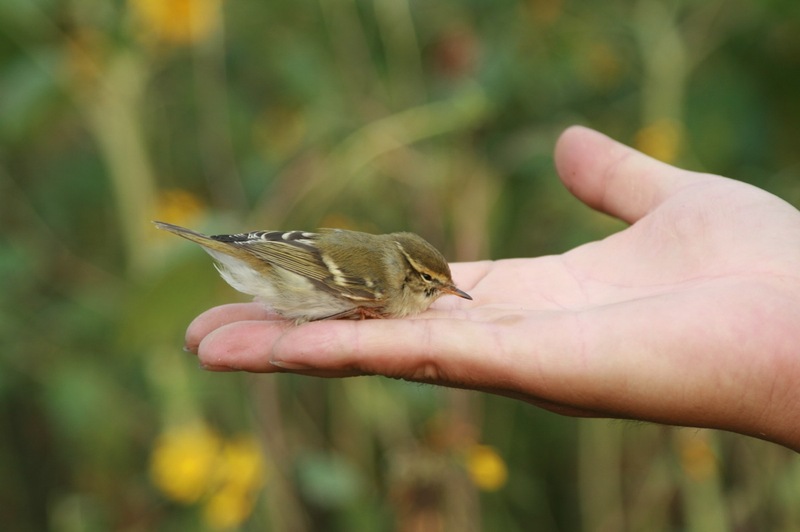 To see the way they trapped, killed and discarded this tiny bird, on its already hazardous migration from Siberia to southern China, was heartbreaking. However, it makes me more determined to stand up for wild birds. Tragic: The head of a Dusky Warbler. For the poachers, it’s worthless and is simply discarded. The Battle of Shunyi rages but, with the police onside and the poachers on the run, it’s only a matter of time before the good guys win! Posted on September 11, 2015 September 11, 2015 Categories UncategorizedTags Beijing, Illegal Mist Nets, Poaching, Shunyi Police16 Comments on The Battle of Shunyi: Local Police Act Fast To Tackle Wildlife Crime! 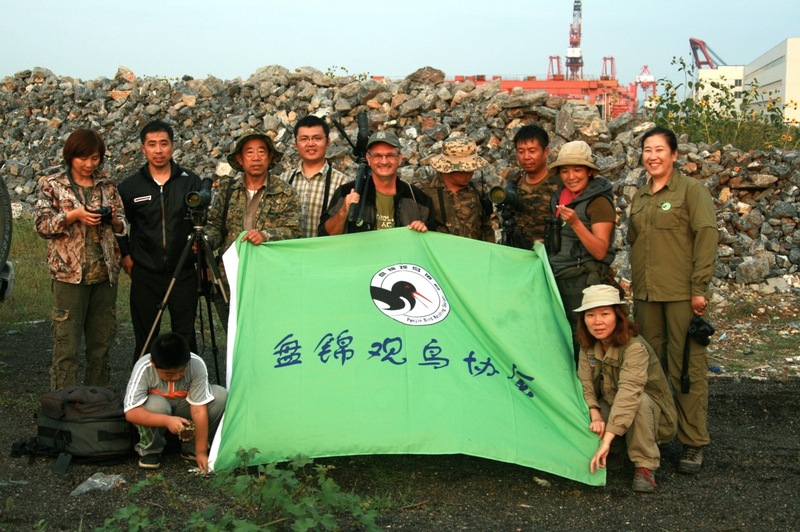 At the Beijing birders meet-up we arranged for a group trip to Nanpu, near Tangshan in Hebei Province. In total, 15 of us – both ex-pats and locals – spent the weekend at this world-class site and it was a superb trip – great fun with lots of birds! The backdrop may not be pretty but the birding is spectacular at Nanpu. Perhaps the best single bird in terms of rarity was an ORIENTAL STORK that came in off the sea. 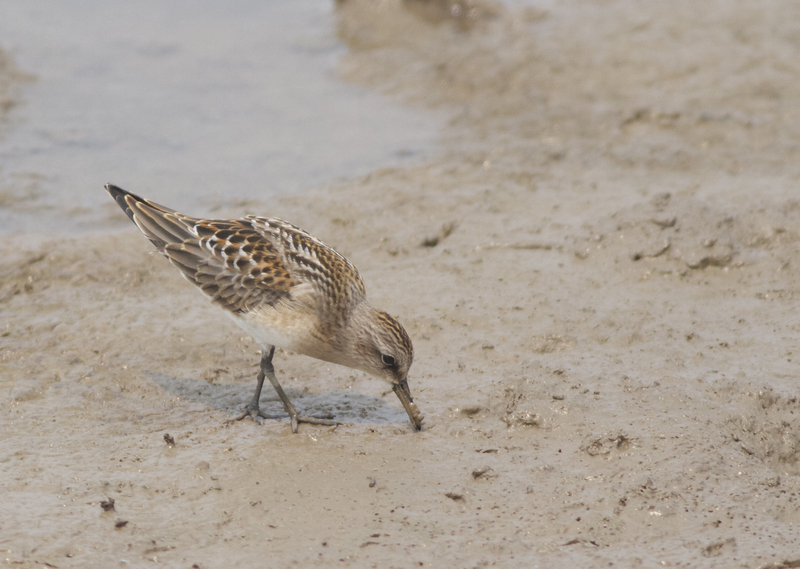 And amongst the other highlights were impressive numbers of shorebirds with 4,700 SHARP-TAILED SANDPIPERS and 2,325 DUNLIN, a single RUFF (rare here), five juvenile RED-NECKED PHALAROPES, at least six first-year SAUNDERS’S and up to 80 RELICT GULLS and decent numbers of passerines moving down the coast. High counts included 54 BLACK-NAPED ORIOLES (including a single flock of 23 birds! ), 100 DUSKY WARBLERS, 300 SIBERIAN STONECHATS, up to 150 RICHARD’S PIPITS, two BLYTH’S PIPITS, two PECHORA PIPITS and six YELLOW-BROWED BUNTINGS. 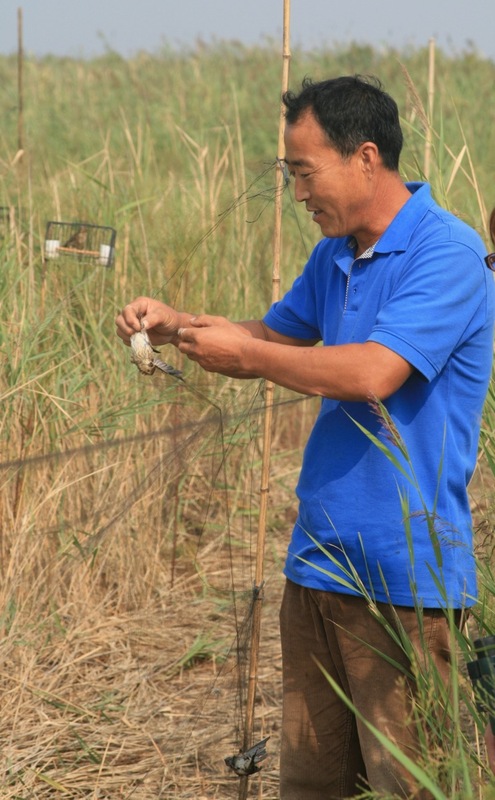 Per checking out the waders on a roadside pond at Nanpu. This is “EVA” the Bar-tailed Godwit. 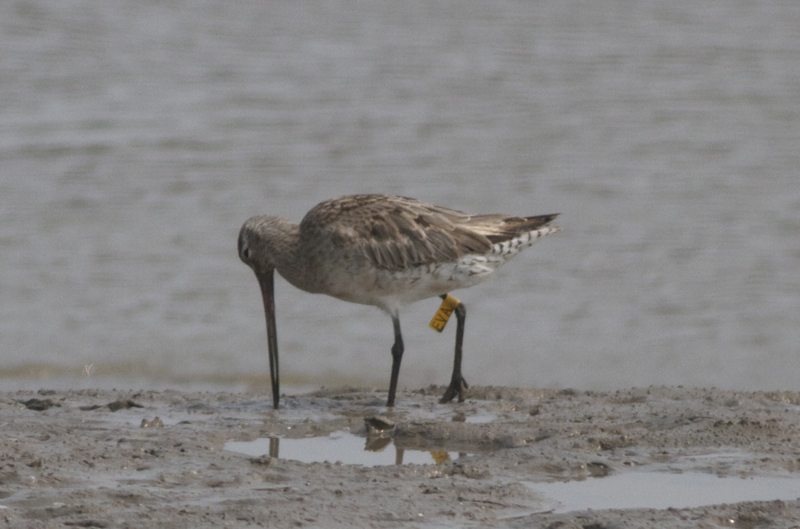 Colour-flagging of migratory shorebirds helps researchers to better understand the routes these birds take and the stopover sites they use which, in turn informs conservation measures. You can read about EVA’s history in the trip report. Juvenile Red-necked Stint. Beautiful birds! 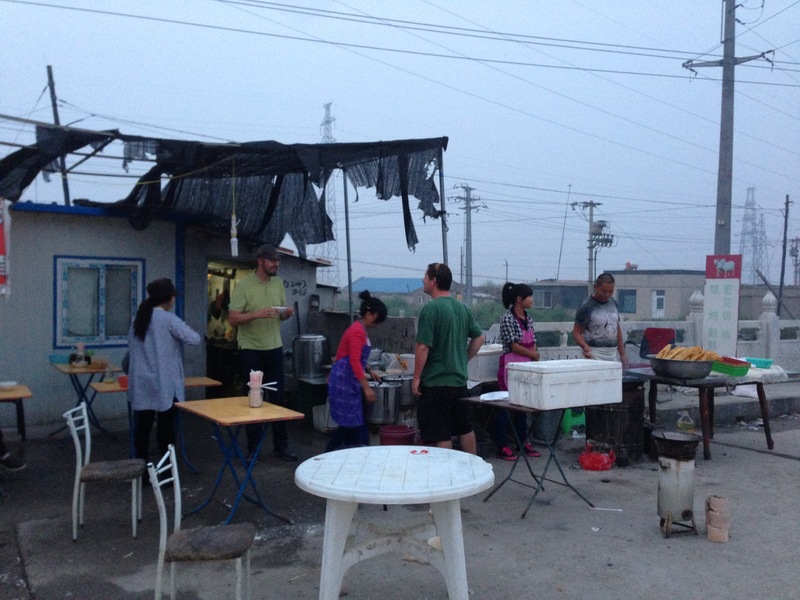 It was hot at Nanpu and, fortunately, there is a small village where one can purchase ice creams! I can thoroughly recommend the ‘traditional flavour’ ice lollies.. delicious (even though I am not sure of what exactly they taste!). The locals here make their living from the mudflats, where they harvest the shellfish and shrimps. 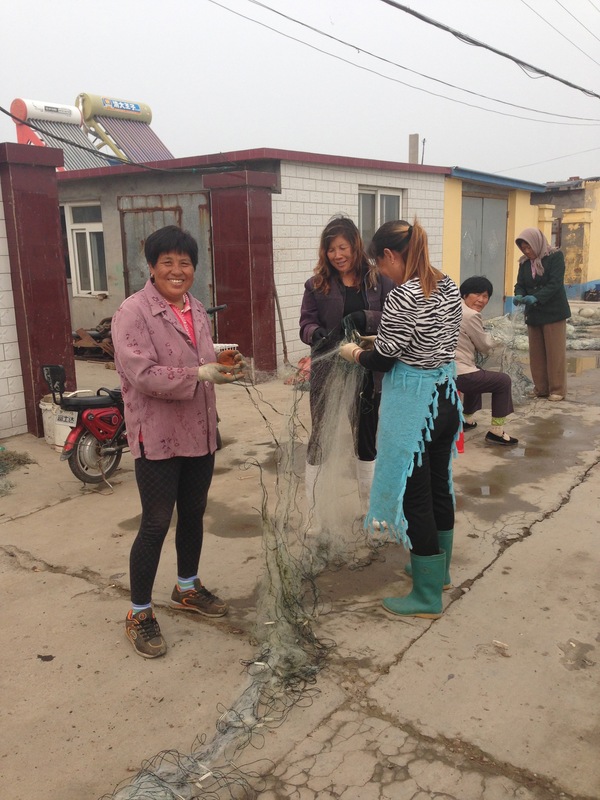 Here are a few maintaining their nets. Jan-Erik and Andrew browsing the local bao zi stall. At the coast, where passerine migration was most impressive, we unfortunately encountered more illegal bird trapping activity. From the car, Paul heard a Yellow-breasted Bunting singing and we stopped to investigate. We very quickly saw a line of mist nets in the grass close by. 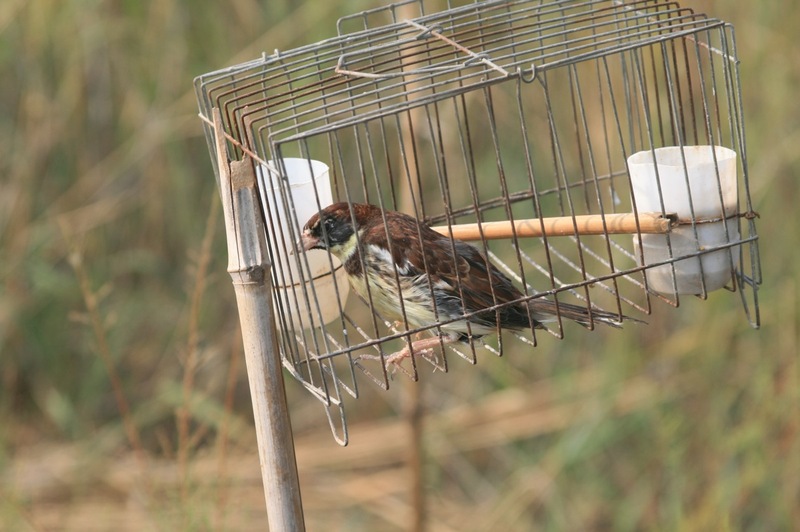 The poacher had set up an elaborate line of nets accompanied by caged songbirds, clearly designed to lure in wild birds. The caged birds included Common Rosefinch, Yellow-breasted and Yellow-browed Buntings – three species that were clearly moving at this time of year. 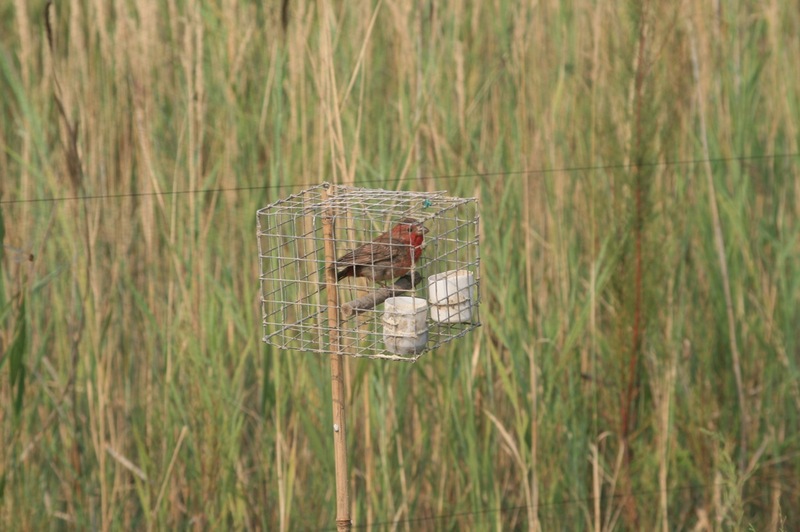 A male Common Rosefinch strategically placed to lure in wild birds. A distressed-looking male Yellow-breasted Bunting, now officially an endangered species after years of persecution. In the nets we found alive 2 Common Rosefinches plus Yellow-browed, Arctic and Dusky Warblers, which we promptly released. But it was too late for 4 Brown Shrikes which had fallen victim to this cruel practice. The poacher soon arrived (claiming that the nets were his friend’s and not his – yeah right). We told him firmly that this was illegal and that we would be taking photos and reporting him to the Hebei Forestry Administration. He did not protest and actually helped us to dismantle and destroy the nets, snap the poles, release the caged birds and destroy the cages. On return to Beijing I posted the photos on Sina Weibo (Chinese “Twitter”) asking for help in reporting this illegal activity. Within 10 minutes, users on the microblogging service had translated my report into mandarin and submitted it to the Hebei Forestry Administration… wow! The power of social media. Thanks guys! Ironically, the next day we were ejected from this area by local security guards from the nearby oil terminal and police who claimed that it was a “nature reserve”. So it’s ok to drill for oil and trap wild birds in a nature reserve but birding is a step too far…! A big thank you to Lei Ming and friends for following up on my behalf with the Hebei Forestry Administration.